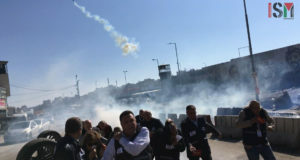 At around 9:00am on Sunday 12th January 2014, students at the boys’ school in Urif, in Nablus district, were assaulted by Israeli soldiers firing tear gas grenades within the school grounds. 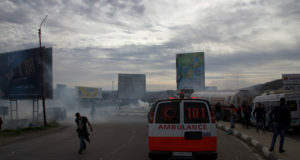 Eleven soldiers from the nearby illegal settlement of Yizhar entered the grounds firing tear gas near the entrance to the school. Several boys resisted the attack by throwing stones. Four of the soldiers then tried to enter a classroom but were prevented from doing so by a teacher. 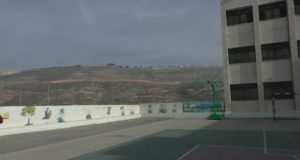 Several hours after the attack, the soldiers remain stationed on a hillside just 200m from the school. This is the second time in two weeks that the village of Urif has been attacked. The last attack, however, which took place on 6th January, involved six settlers from the illegal settlement Yizhar trying to damage an electricity box attached to the town’s water reservoir. The incursion led to clashes in which Palestinian boys threw stones to repel the settlers.